By now you've read about the "Brexit" and why it was or was not a good idea. A presidential contender found himself in the middle of further discussion when discussing his golf property and how the Pound's demise might help his fortune. This is not what this article will cover. I would like to make several points for readers to consider particularly within the broader context of what is occurring in the world today. This is difficult to reconcile given how close the polling was in the weeks prior to the referendum. Also, don't be deluded into thinking the Brits would stay in the EU based on betting lines. I believe the lines were such that bookies suggested a 75% chance of staying. This meant that they felt there was a 75% chance of the vote being at least 50.1% (or some approximation thereof) for staying. Those understanding betting lines know that they are not a prediction of an outcome but rather a fulcrum that attempts to divide the public into equal apportionment on both sides. An objective observer would have anticipated a very close vote. Something not discussed in the TV media I have followed is the fact that the referendum is but a step prior to a parliamentary vote, parliament has the final say. Some might suggest that parliament should just vote according to the will of the people. I saw something on Meet the Press this morning where the host asked former British foreign secretary David Milliband about a movement that has garnered some 3 million signatures requesting a re-vote. Mr. Milliband replied that the suggestion was premature and that Brits should honor the process. With the current mess in UK politics, it is difficult to predict what parliament may do. Irrespective, what is most important in my analysis is the remaining turbulence around the issue. There have been many weighing in on that including the POTUS and Prime Minister Cameron, who staked his political career on the outcome (he indicated he will leave office by October). It is certainly not my place to suggest to the citizens of another country how they should've voted on this referendum. Let's understand that the UK's participation in the EU is not monetary, since they have their own currency, but rather a customs arrangement. Within the UK, there are many reasons for leaving where those on the far left want a more protected economy free from interference from Brussels. Those on the other end of the spectrum might want something more akin to free trade. Still others voted and where unclear about the actual definition of the EU. You might ask yourself, why after 43 years, did the UK decide to have this referendum? In my writings I discuss the social cycles at play in economics. These cycles greatly influence how people react politically and economically. The current social cycle emphasizes societal discord. The feelings of the citizens of the UK changed and political leaders like Prime Minister Cameron were unable to gauge this sentiment properly. The same discord can be ascribed to the concept of the European Union. The EU was based less on sound economic principles and more on an authoritatively based bureaucracy. At one time, the union seemed like a perfectly good solution to the European continent's economic and political ills. Unions are bull market phenomenon whereas disunions represent bear markets. The social/economic/political decay since the 2008 financial crisis (and perhaps as early as the 2000 market top) has been masked by central bank bailing wire. The immediate impact of the leave vote was noted in the fall of the British Pound relative to the US Dollar. A casual observer would suggest the Brexit "caused" the Pound to fall. A more detailed observer would also note that the Pound has been falling against the greenback for over a year, thus questioning the causation argument. I will also question the causation argument with respect to the Japanese Yen, which surged on the Brexit vote. This currency was already moving upwards for months. The Yen is prima facie evidence that logic does not apply to trading markets otherwise the Yen's position as a reserve currency would be under serious question given the country's massive government debt and historic intervention by the Bank of Japan (BoJ). I would pay special attention to the US Dollar Index (USDX). The USDX made an important low on May 3 and appears to be moving impulsively towards a new high, though it will take weeks for this to occur. The Brexit vote simply added more fuel to the move. With respect to the U.S. stock market, Friday, June 24 saw the Dow fall by 600 points. At this juncture, I would not attach much significance to the move, in and of itself. Last October, when Isuggested that the stock market's run was over, I highlighted how the broad trading range of August 2015 would serve as an attractor for future prices. 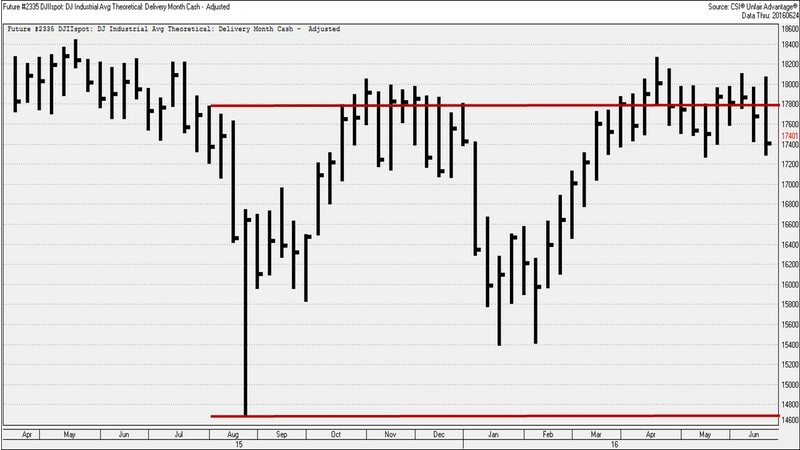 The graphic below (weekly DJIA) shows how the preponderance of trading since August has occurred within the range I indicated (parallel red lines). The last price mark on the right included the Brexit move. Moreover, if the top red bar was extended to late May 2015, it would contain the entire trading range of the last 13 months. As further evidence of the market's indecisiveness, the DJIA's weekly closing price has struggled to close above the top red line. Until we witness a meaningful move outside of the red lines, it will be difficult to conclude something one way or the other. 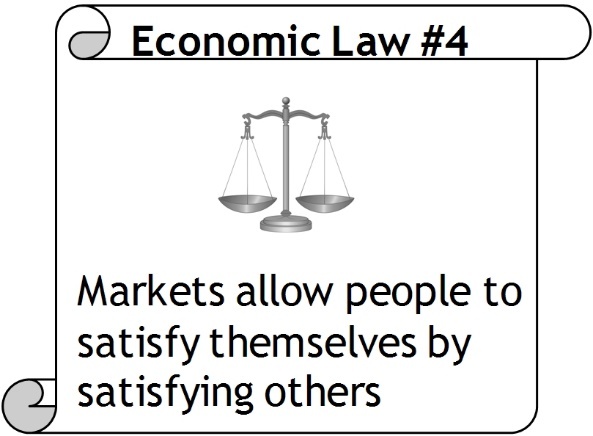 Economies are expressions of what people do. People are remarkably adaptable to working within the structure of their economies. The outsourcing of this structure to supranational entities like the EU produces greater extremes in behavior influenced by human psychological components. We find ourselves at such a moment in economic history. The Brexit is merely an expression of the market reasserting itself. Prepare yourselves for many more of these reassertions in the US and abroad.